Bullet Real-Time Physics Simulation | Home of Bullet and PyBullet: physics simulation for games, visual effects, robotics and reinforcement learning. We investigate whether a robot arm can learn to pick and throw arbitrary objects into selected boxes quickly and accurately. Throwing has the potential to increase the physical reachability and picking speed of a robot arm. However, precisely throwing arbitrary objects in unstructured settings presents many challenges: from acquiring reliable pre-throw conditions (e.g. initial pose of object in manipulator) to handling varying object-centric properties (e.g. mass distribution, friction, shape) and dynamics (e.g. aerodynamics). 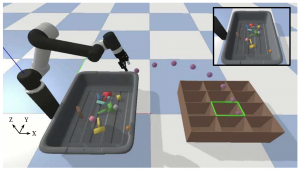 In this work, we propose an end-to-end formulation that jointly learns to infer control parameters for grasping and throwing motion primitives from visual observations (images of arbitrary objects in a bin) through trial and error. Within this formulation, we investigate the synergies between grasping and throwing (i.e., learning grasps that enable more accurate throws) and between simulation and deep learning (i.e., using deep networks to predict residuals on top of control parameters predicted by a physics simulator). The resulting system, TossingBot, is able to grasp and throw arbitrary objects into boxes located outside its maximum reach range at 500+ mean picks per hour (600+ grasps per hour with 85% throwing accuracy); and generalizes to new objects and target locations. Deep learning has achieved astonishing results on many tasks with large amounts of data and generalization within the proximity of training data. For many important real-world applications, these requirements are unfeasible and additional prior knowledge on the task domain is required to overcome the resulting problems. In particular, learning physics models for model-based control requires robust extrapolation from fewer samples – often collected online in real-time – and model errors may lead to drastic damages of the system. Directly incorporating physical insight has enabled us to obtain a novel deep model learning approach that extrapolates well while requiring fewer samples. As a first example, we propose Deep Lagrangian Networks (DeLaN) as a deep network structure upon which Lagrangian Mechanics have been imposed. DeLaN can learn the equations of motion of a mechanical system (i.e., system dynamics) with a deep network efficiently while ensuring physical plausibility. The resulting DeLaN network performs very well at robot tracking control. The proposed method did not only outperform previous model learning approaches at learning speed but exhibits substantially improved and more robust extrapolation to novel trajectories and learns online in real-time. Enabling autonomous robots to interact in unstructured environments with dynamic objects requires manipulation capabilities that can deal with clutter, changes, and objects’ variability. 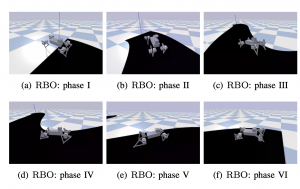 This paper presents a comparison of different reinforcement learning-based approaches for object picking with a robotic manipulator. We learn closed-loop policies mapping depth camera inputs to motion commands and compare different approaches to keep the problem tractable, including reward shaping, curriculum learning and using a policy pre-trained on a task with a reduced action set to warm-start the full problem. For efficient and more flexible data collection, we train in simulation and transfer the policies to a real robot. We show that using curriculum learning, policies learned with a sparse reward formulation can be trained at similar rates as with a shaped reward. These policies result in success rates comparable to the policy initialized on the simplified task. We could successfully transfer these policies to the real robot with only minor modifications of the depth image filtering. We found that using a heuristic to warm-start the training was useful to enforce desired behavior, while the policies trained from scratch using a curriculum learned better to cope with unseen scenarios where objects are removed. Check out the PyBullet Quickstart Guide and clone the github repository for more PyBullet examples and OpenAI Gym environments. 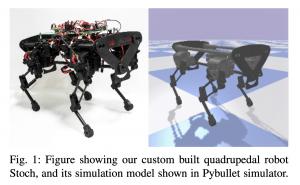 A while ago, Our RSS 2018 paper “Sim-to-Real: Learning Agile Locomotion For Quadruped Robots” is accepted! (with Jie Tan, Tingnan Zhang, Erwin Coumans, Atil Iscen, Yunfei Bai, Danijar Hafner, Steven Bohez, Vincent Vanhoucke). See also the video and paper on Arxiv. Perception and being active (i.e. having a certain level of motion freedom) are closely tied. 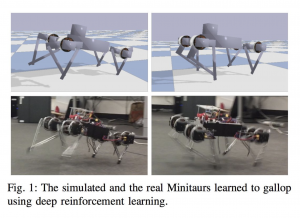 Learning active perception and sensorimotor control in the physical world is cumbersome as existing algorithms are too slow to efficiently learn in real-time and robots are fragile and costly. This has given rise to learning in simulation which consequently casts a question on transferring to real-world. 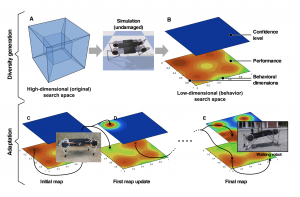 In this paper, we study learning perception for active agents in real-world, propose a virtual environment for this purpose, and demonstrate complex learned locomotion abilities. The primary characteristics of the learning environments, which transfer into the trained agents, are I) being from the real-world and reflecting its semantic complexity, II) having a mechanism to ensure no need to further domain adaptation prior to deployment of results in real-world, III) embodiment of the agent and making it subject to constraints of space and physics.